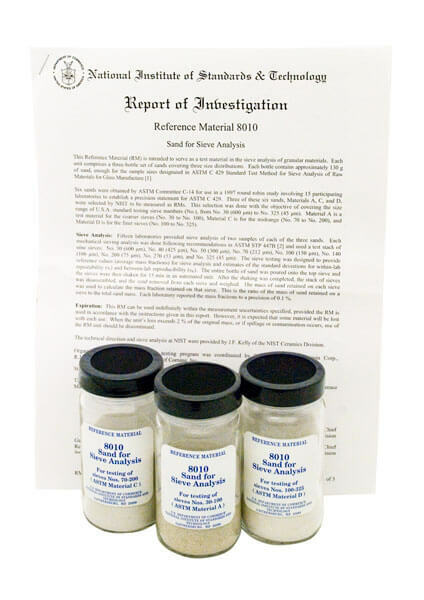 NIST Sand No.30 - No.325 (600 - 45µm) for Sieve Calibration - Gilson Co.
BS-42 NIST Sand, No. 30—No. 325 is used for testing a range of sieves from No. 30—No. 325 (600—45µm) and each set includes three 150g bottles of different sands. Material A is the coarsest for testing sieves from No. 30—No. 100. Material C is for No. 70—No. 200 sieves and Material D is for finer sieves­-No. 100—No. 325.